Delcam is pleased to announce expansion into the Jewellery market in the United States. Accompany the existing direct sales channel with Scott Ingram will be John Stewart of Goldsmith CAD CAM (GSCC) and Randy Hays of Artisan CNC. Both John and Randy have extensive knowledge and training of the jewelry industry through working with ArtCAM JewelSmith and Model Master Mills. John Stewart has been a bench Jeweller since 1981. John started working with ArtCAM JewelSmith in 1996 when he began working as a trainer at Model Master. "John’s years of learning and using ArtCAM JewelSmith along with his bench training will be a definite asset to the sales and support of ArtCAM JewelSmith in the East Coast of the United States,” commented Sean Plunkett ArtCAM Sales Manager for North America. Artisan CNC, with representatives throughout the United States is a leading provider of CAD/CAM technology for the jewelry industry. 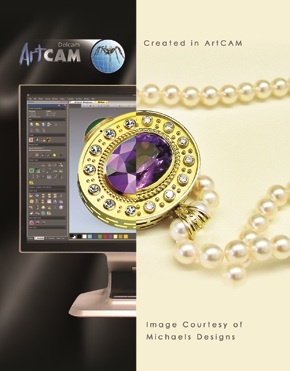 Artisan's professional staff has extensive knowledge and training in the jewelry industry through their long association with ArtCAM Jewelsmith and the ModelMaster line of CNC mills. Artisan is proud to introduce the NEO, a professional 5-axis mill designed specifically for jewelry production.